After just a tiny bit of a break, the fine folks at CinemaQuestria are ready to get back on track with their regular Friday Game Nights! Kicking things back off, we're wrapping up the week this time with the legendary Cards Against Humanity. ...Which reminds me that I need to perhaps play this game for myself at some point, it certainly looks like an experience! Anyway, check out the list below for the usual details, and have fun! Time: 9:30 pm EDT on March 24th. 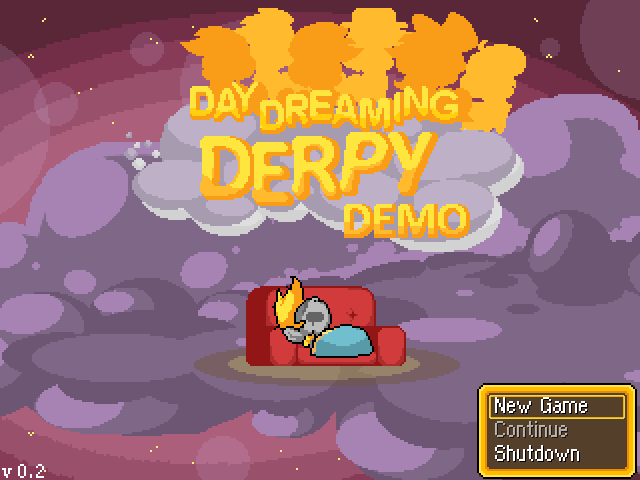 An update had recently been released for the charming JRPG affair, Day Dreaming Derpy. This gorgious game received it's big 'Sweetie Belle update' just a few days ago, introducing a new dream area, a new awake area, new dreams, new uniforms, new followers, one of which you can probably guess from the title of the update, and a whole array of fixes. What can I say without reiterating points in our previous post on the game? This really is one of the biggest surprises we've had here for a while, A short sweet demo of a JRPG featuring everypony's favourite muffin enthusiast, exploring the dreams of her fellow ponies. Absolutely beautiful artwork, with only insignificant clashing styles. You wouldn't guess that it is a mere RPG Maker game just from looking at it, really breaking the cookie cutter style you usually see in those easy-to-use engines. Very approachable and simple combat and gameplay, unlike what you would expect when someone brings up JRPG's. Feels very stripped down, in comparison to your Final Fantasies, but never really lacking, unless you're going in expecting another overly complex grand RPG experience. It is small, it is cute, it feels familiar and emotional and I wholeheartedly recommend anyone to give it a go. It puts a smile on your face, nothing less. Check out the links below for a trip to the game's official page and our download mirror, authorized with permission of the developer. Looks like we've just missed the boat (well, that's certainly a new one) on having something relevant to post on Starlight Glimmer Day, but such is life. We've come across a pretty interesting little track from the artist Limey Lassen, a remix of Starlight's in-show BGM evidently inspired by the wonderful Starlight Glimmer Simulator! Check it out above, and be sure to give the artist some love! It's been a little slow these past two weeks, but hey, here's a post, so no worries! Once again a little bit late on the uptake, we've got a fairly (probably a bit of an understatement, haha) important update from the now-formerly-named Fallout Equestria team, The Overmare Studios. Provided below the break is the statement from their website regarding the name change, including the always-lovely legalese behind their decision to do so, and above is the link to the latest demo released concurrently with the change. As an aside, I'd like to take the opportunity to post a little reminder that the Submit button up there exists! Please send us news and other horse game junk when you notice it; even if you think we already know about it, we'd still appreciate the heads-up! We're just a few people here behind the curtain, so we can't (and don't) always catch everything immediately! Happy Derpy day everyone! Due to this glorious occasion, I thought it would be the perfect time to present a trilogy of games that I'd been working on for the majority of last year. This is a series of 3d platformer collect-a-ton games designed to be as unpredictable and silly as possible, much like the character herself. While the first game is quite simple, since it was made in three days, the other two games are much more complete, imaginative and most importantly, stable! If you're in the mood for goofy satires of platforming games, these are the perfect masterpieces for you!